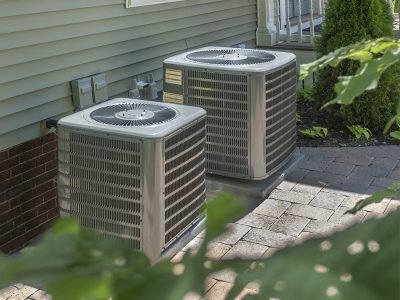 When you talk to the air conditioning experts in Murfreesboro about setting up a new installation in your home or business, it’s wise to choose an efficient unit. Efficient air conditioning installation can save you money, make your space more comfortable, and help to protect the environment. SEER ratings are designed to help you understand the efficiency of your HVAC units so that you can make an informed decision when you purchase a new one. Understanding how these ratings work is key to finding the right unit. Keep reading for a crash course in SEER ratings. SEER is an acronym for seasonal energy efficiency ratio. This rating system is used to determine how efficient a cooling system will be, making it easier for customers to decide which type of air conditioner will best suit their needs. SEER ratings specifically look at the amount of energy that a given cooling system needs in order to adequately cool your space. If you’re in need of a new air conditioning installation, it’s a good idea to learn about the SEER system so you can make the right choice. We’ve established that SEER ratings help consumers determine how efficient different cooling systems are, but why is that such a big deal? If you care about the environment or your bank account, it’s a huge deal. More efficiency in your cooling systems means that you will spend less money on your energy bills. You’ll still stay perfectly comfortable, but you’ll notice that your monthly expenses have been reduced. Efficient cooling systems, which have high SEER ratings, will also reduce your carbon footprint and your impact on the environment. Unless you understand how to interpret a SEER rating, it won’t do anything for your next air conditioning installation venture. Fortunately, the rating system is easy to understand. A higher SEER rating means that the unit is more efficient, making it easy to compare prospective options without the help of an air conditioning expert. Remember that today’s cooling systems typically come with much higher SEER ratings than those of old. It is important to ensure your cooling system is running well during the summer to prevent unnecessary energy use and costly bills. You can achieve a better performance from your HVAC system with a visit from an air conditioning expert in Murfreesboro . In addition to scheduling regular maintenance for your cooling system, you can plant shade trees and install extra insulation around your home. Let’s take a look at how these steps can keep your cooling costs low. Shade trees—like maples, willows, and eucalyptus—planted around your home and property can significantly cut down on your cooling costs. These trees should be planted on the south and west sides of your home, because these areas will likely receive the highest amount of sun and solar heat throughout the day. Plant large-canopied trees to shade your windows and entrances, because these areas will experience more air leakage into and out of the house. If you have an AC unit on the ground, then consider planting a shade tree nearby to provide shade to the unit. Yearly air conditioner maintenance is vital to the health of your unit, and it can ensure that your cooling costs stay low. If your cooling system is not seen by an air conditioning expert every year, then it could lose up to 5% of its efficiency. This means that your AC unit will work harder to give you the same level of cooling, and you will end up spending more money every year. If you schedule yearly maintenance, though, then you can keep your unit running great and save on your cooling costs. Insulation can significantly cut down your cooling costs. Insulation buffers your home against heat and cold intrusion. Ensure that your attic, crawlspace, and basement are well-insulated. You can also insulate other areas of your home, such as your windows, with layers of foamboard and cellular shades. These home additions will keep out the summer heat and cut your cooling costs. It is important that your home’s cooling system in Murfreesboro be well-maintained throughout the year. With the help of an air conditioning expert, you can ensure that your cooling costs are low and that your air conditioner runs for a long time. Continue reading to see some important dos and don’ts of air conditioner maintenance. Every year, before summer begins, you should schedule an air conditioning expert to inspect your entire cooling system. This annual air conditioning maintenance and cleaning is essential, because it ensures your unit is running properly. Annual maintenance also ensures that your unit is running at peak efficiency, which will keep your cooling costs low. If you do not schedule annual maintenance, then you could lose up to 5% of your unit’s efficiency every year. Your thermostat can have a big impact on your entire cooling system, including your cooling costs. If your thermostat is malfunctioning or it is low-quality, then your cooling system may not be functioning at peak efficiency. When you do use your thermostat, set it at a moderate level to keep your home cool and gain maximum energy-saving potential. Air filters are one of the most important factors to a well-running cooling system. If your air filters are not clean and free of dust and dirt, then your air conditioner will work too hard and your indoor air quality will be subpar. Your air filters should be replaced every three to four months and once monthly during the summer. During your annual inspection and cleaning, your air conditioning expert will look for any clogs or debris that has collected in your outside unit. It is essential that insects, rodents, nests, and leaves be kept out of your unit. This debris will prevent air flow from going through the system, which will damage the unit and make it work harder. An air conditioning installation in Murfreesboro probably sounds like something you can handle, but is it the best idea for you to put it in yourself? You might instead consider calling the air conditioning experts to make sure the job is done right. This will free up your time and energy so you can focus on your daily routine, and it will also help to ensure that your air conditioner is as effective as possible throughout its working life. You can also take the time to ask your air conditioning installation pro about what you can do to care for your new unit. Here’s a closer look at why you should trust the pros with your air conditioner installation. 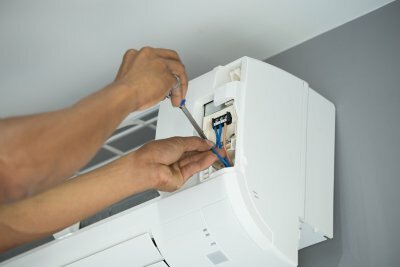 Even installing a small air conditioner in your window can be difficult on your own, and a full-sized unit will only be more challenging if you don’t have the help of an air conditioning expert. 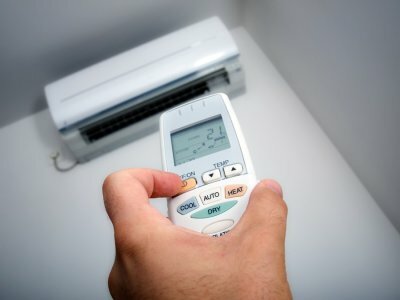 On top of how difficult air conditioning installation can be to an untrained person, you might simply not have time or capacity to take the project on yourself. If you are busy working and taking care of your kids, a professional air conditioning contractor can make sure that the job gets done. This is also helpful for those who are handicapped and cannot install an air conditioner by themselves. 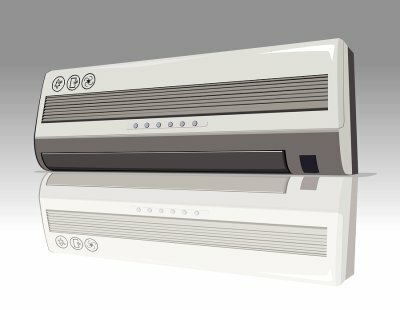 Today’s air conditioners are more efficient than ever, but the way your unit is installed will impact its efficiency over time. Working with a professional air conditioning installation company will ensure that your cooling unit works well without costing you too much money. As long as you maintain your air conditioner after it’s been installed, you may be able to make your money back through energy savings. 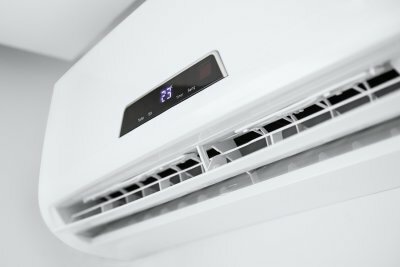 It’s perfectly normal to have questions about an investment of any kind, and the air conditioning experts can tell you anything you need to know about your new unit. Ask your air conditioning installation expert about how you can make your home as comfortable and cost-effective as possible. Which Maintenance Savings Plan Is Right For You? It is easy to forget about your heating system and cooling system—until something goes wrong. To keep your HVAC system in great shape, consider signing up for a maintenance savings plan. A maintenance savings plan will make it easy for you to schedule routine HVAC maintenance, as well as heating repairs or air conditioning replacement in Murfreesboro in case something goes wrong. 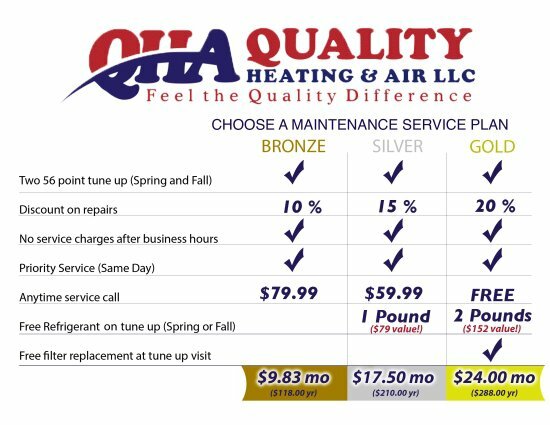 At Quality Heating & Air, we offer three different maintenance savings plans. Our Bronze plan includes spring and fall tune-ups, a 10% discount on repairs, and priority service. In addition, service charges for after-hours appointments are waived, and the basic service call fee is $79.99. Our next plan is the Silver plan—this plan increases the repair discount to 15%, and reduces the service call fee to $59.99. For the greatest peace of mind when it comes to your heating system and air conditioner, consider our Gold plan. This plan includes a 20% discount on repairs, free service calls, and free filter replacement during each tune-up visit. Contact us to learn more about these plans and the other services we can provide.